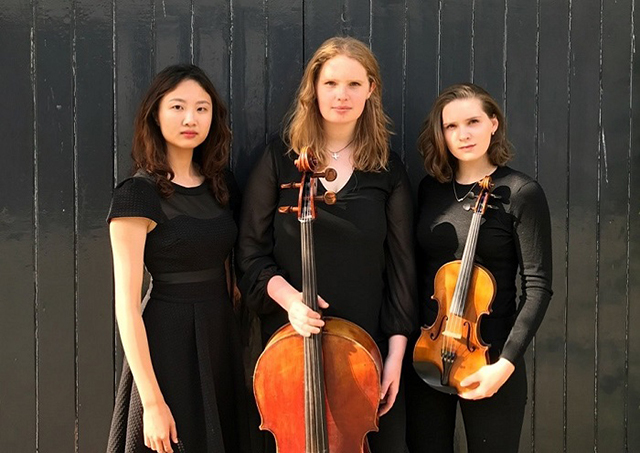 The Odora Trio was formed in 2016 at the Royal Academy of Music. Since then, the trio have had various coaching from professors such as Andrew West, Michael Dussek and Melissa Phelps. Being part of the Royal Academy and Royal College, they have been able to rehearse and perform at both spaces. They have also performed at the London Charterhouse and Eaton Square. They were prize winners at the Isaacs and Pirani piano competition in May 2017 at the Royal Academy. Songeun Choi was born in 1997 in South Korea. She became a pupil at The Purcell School in September 2007 and studied piano with Carole Presland until 2010, continuing with William Fong, who she currently studies under at the Royal Academy of Music, where she is supported by a scholarship. 20-year-old cellist Harriet Butterworth is currently studying with Melissa Phelps at the Royal College of Music as a foundation scholar supported by a Douglas and Hilda Simmons award. In September 2014, Hattie was accepted into the sixth form at Chetham’s School of Music to study with Anna Menzies. Sophie Hinson is a violinist from Nottingham, who is currently studying at the Royal Academy of Music in London with a scholarship, under the tutor-ledge of Philippe Honoré and previously Mateja Marinkovic, and voice with Catherine Benson. Previously, Sophie attended Chetham’s School of Music in Manchester, studying violin with Michael Gurevich and singing with Margaret MacDonald.